Hilary Plum’s Strawberry Fields will no doubt be labeled a “political” novel, but that would serve only to bind this novel to an already ill-defined concept (when applied to literature) that becomes even more opaque at a time when political awareness has become especially urgent and we are frequently told that “all art is political.” Strawberry Fields addresses a subject (more precisely, an array of connected subjects) that certainly elicits deeply felt political responses, in the novel mostly centered on American foreign policy, although also including other government misadventures, such as the Hurricane Katrina debacle, but can we say that such responses are the effects the author most wants to provoke? Is Strawberry Fields a “critique” of American political derelictions, an effort to express a political perspective through fiction? Of course, we can never be certain about a writer’s intentions short of direct testimony by the writer, and even then such testimony is not decisive, since what an author claims she intended to achieve in a work of fiction may or may not correspond with what readers value in that work, and does not finally determine how it should be interpreted. Still, it seems relatively certain that Hilary Plum would not want her novel to be received as if its political content—especially as that content is reduced to what the author purportedly wants to “say”—is to be regarded as its only source of interest. If the novel is meant primarily as a condemnation of American imperialism or the depredations of Western technological capitalism, surely such a critique could be carried out much more directly and without the contingencies and ambiguities created by the segmented formal structure Plum has employed. The novel includes a large cast of characters, but most of these characters appear only once, in a self-enclosed episode centering exclusively on that character’s experience. Most of the episodes as well have little if any connection to the others, except insofar as the characters find themselves in vulnerable or extreme situations, often associated, although not always, with political instability (especially related to the Iraq War). The closest thing to a linear narrative the novel offers are the sections headed “Alice,” which feature the titular character, a journalist, and detective named Modigliani, who, we learn, first teamed up to investigate a pair of suspected murders during the aftermath of a destructive hurricane, and in the present action of the novel have joined together again after five veterans of the Iraq War are found murdered. It would be misleading, however, to say that these recurrent sections devoted to Alice and Modigliani (sometimes Alice alone) really constitute a “story.” The crime that brought them together originally remains unsolved, and their inquiries into the circumstances of the veterans’ deaths come to no more decisive conclusion. Indeed, both Strawberry Fields as well as Plum’s previous novel, They Dragged Them Through the Streets, are strongly informed by the conceit of investigation or inquiry, the desire to know, but in both cases the desire can’t really be fulfilled; the novels are as much about the limitations of our ability to know as they are their ostensibly more immediate subjects, about which we are given hints and intimations rather than definite answers to the questions their situations prompt. Thus, in Strawberry Fields we are given reasons to suspect that a shadowy military contractor called Xenith (likely modeled on Blackwater) might have been responsible for the killings in each of the cases Alice covers, but finally they, as well as Xenith itself, continue to be murky and mysterious. This, however, is a strength of the novel rather than a narrative defect or a sign of the author’s lack of commitment. 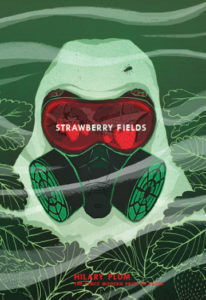 Few novels could be as literally plotless as Strawberry Fields, but this is because the novel resists the sort of narrative progression plot brings with it, progression that entails a kind of closure that Plum wants to suggest is unavailable at a time when events seem determined by forces beyond our reach, shady actors good at concealing their traces, when we live in a world that has grown ever more connected but that in the process seems only to magnify the perception that we are powerless to mitigate or even understand the turmoil that ceaselessly confronts us. The order enforced by plot no doubt would seem a falsification of reality for a writer who, however much her novel departs from ordinary expectations of what makes a novel a novel, clearly does want to render a truthful portrayal of 21st century reality and of the efforts made by her novel’s characters to cope with it. Alice is the most thoroughly developed character in the novel (Modigliani remains somewhat enigmatic), although the characters featured in the individual episodes are vividly evoked despite the relative brevity of their appearances. The portrayal of Alice partly works to illustrate the burdens of journalism in the world we currently inhabit. Alice sincerely wants to uncover the truth, but finds it nearly impossible to locate. The private detective Modigliani ostensibly also seeks the truth, although he seems more removed, more resigned, perhaps, to the obstacles in his path. A number of the other characters introduced are writers of various kinds, and ultimately it is as if the author of Strawberry Fields mirrors in her own novel’s inconclusion and fragmentation the efforts many of these characters themselves make to bring words to account in the face of a recalcitrant reality, finding through such efforts that a coherent perspective on this reality remains elusive. When the expressive power of language falters, perhaps the best a writer can do is represent attempts to express, in the case of Strawberry Fields, by juxtaposing multiple such attempts and achieving, if not a final, comprehensive view of the truth, at least a cross-section of efforts to discover it, putting us in the presence of a recognizable truth even as its definable characteristics lurk beyond our immediate apprehension. The vision that the novel’s unorthodox formal structure serves, then, is ethical, not specifically political. In its purposeful discontinuity, the novel assumes the task of bearing witness to the impediments obstructing the truth, as well as the hardships endured by those living in a world where truth seems so obscure. While America’s 21st century military adventures and inattention to suffering most prominently contribute to perpetuating such conditions, these are not the only sources of venality and corruption surveyed by Strawberry Fields, and the ultimate barrier to human flourishing is the more general human capacity to regard the lives of others as dispensable, collateral damage to the pursuit of power and control. The novel’s predominantly bleak tone, reinforced in its conclusion, which seems at first an attempt to rally some final conviction in the efficacy of writing only to falter via a final reminder of its insufficiency, doesn’t really position it as an appeal to political action; it does establish the novel as a painstakingly honest exploration of the conditions that make such a bleak outlook sadly appropriate. If Strawberry Fields deflects some of our attention away from the usual interest in plot and character, its formal arrangement deftly reinforces its ethical ambitions. In fact, it would be more accurate to say that the ethical content itself emerges from the formal design Plum has used. Strawberry Fields may be one of those rare novels in which what the novel wants to “say” is virtually indistinguishable from the way it is said.